Less than 2 miles (3.2 km) from junction 21 of the M1 motorway and only 2.5 km (4 km) from Leicester's city centre, the hotel offers comfortable, great-value rooms and free parking. On one of the main routes into the heart of the city, the Premier Inn Leicester Braunstone South is only 2 miles (3.2 km) from Leicester Railway Station. The hotel has a 24-hour reception desk and all of the rooms have satellite TV and telephone/modem points. Some rooms can take 2 adults and up to 2 children (under 16 years). The 2 children also get a free full breakfast when accompanied by an adult eating a full breakfast. An all-you-can-eat buffet breakfast is available each morning and includes scrambled, fried, poached or boiled eggs, and pork or vegetarian sausages. There is also a wide continental selection. There is a Costa coffee shop, a business lounge and the on-site restaurant offers good food and drink at great-value prices. 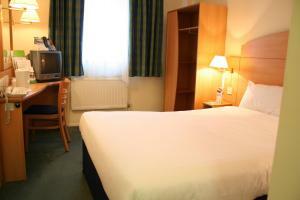 The Print House offers budget en suite rooms with plasma-screen TV and free Wi-Fi. The centre of Loughborough is within walking distance. There is easy access to the M1 motorway, and Loughborough bus and rail links are within walking distance. Also close by is a 24-hour bus service to East Midlands Airport. No meal services are available at The Print House, but there is a caf?-bar next door offering a range of drinks, snacks and meals. You might use The Print House as a base to visit the Great Central Railway, Bradgate Park, Beacon Hill, Alton Towers, Drayton Manor, Carillon War Museum or Donington Park Race Circuit. 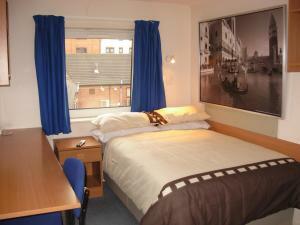 The Print House is a student hall of residence. Whatever the purpose of your stay, this exquisitely restored Victorian Town House Hotel will charm you with its grace and elegance. Formerly a Convent, the Regency retains some enchanting historical features. Every nook and cranny echoes moods of times past. Thirty two bedrooms, each individually designed, offer comfort, tranquillity and all the appropriate facilities one would expect of a busy Town House Hotel. Two choices for dining are on offer, seven days a week. The Town House Restaurant for ? la carte dining and Langtrys Brasserie for a more relaxed and informal atmosphere. The Regency specialises in catering for conferences, private parties, banqueting and wedding receptions for up to 120 guests. Dinner dances, murder mystery dinners, jazz nights, themed nights and much more are held throughout the year. 2Km from the main Train Station and City Centre Please note that there is no lift at the hotel . 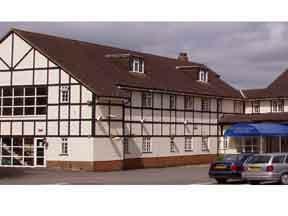 This Marriott hotel is 4 miles (6.4 km) from Leicester city centre, in a quiet setting just minutes from the M1. Enjoy air-conditioned rooms, heated swimming pool, gym, sauna and steam room. Bedrooms at the Leicester Marriott Hotel have soft, luxurious bedding, a 32-inch (81 cm) flat-screen TV, and a dedicated work space with high-speed internet. Try the Mixx Restaurant for cuisine with a European and Asian influence, or the relaxed Tanners Bar. Car parking is free at weekends (additional cost from Monday to Friday). Ideally situated for Leicester, Nottingham, Loughborough and Melton Mowbray, this hotel has a direct motorway link to East Midlands and Birmingham Airport. 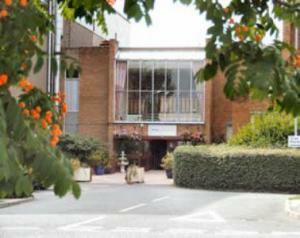 Located opposite the Carter and Carter Training centre, the hotel is also not far from the National Exhibition Centre. 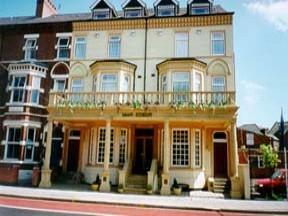 The hotel offers an in-house restaurant and bar serving a selection of speciality beers and fine home-cooked food. Rooms have rural surroundings and are equipped with all necessary facilities. Ample parking is provided free of charge. This spectacular 3-story granite building has been lovingly restored with an added touch of the contempory. Enjoy a large garden, open fires and ? la carte restaurant. After a day of travel or exploring the surroudnigns, relax in the inviting leather sofas and chat with friends. Here, you can also browse the wireless internet for free. The Hunting Lodge boasts 6 individually styled bedrooms ranging from the ethnic origins of the Biko room to the regal opulence of the Louis room. The Hunting Lodge's restaurant offers an extensive ? la carte menu boasting delicious homecooked meals. This attractive and well-appointed 3-star hotel is situated in the heart of Leicester and is a great base for exploring and enjoying this exciting and vibrant city. Formerly Days Inn, the Sky Plaza Hotel is a traditional hotel, situated within a 2-minute journey of all of Leicester's shops, pubs, bars, theatres and shopping centres, as well as all of its many restaurants, which offer a rich variety of cuisines. We are situated in 5 acres of Leicestershire countryside, and within our glorious grounds are 2 rivers and a fishing lake available for corporate days and events. There are several bridges and plenty of stunning views and scenery. 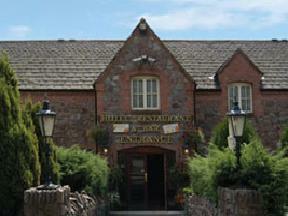 Within the hotel itself, we have a working watermill in the dining area that is naturally propelled by the River Soar. Fireplace dining, a secluded seating area and a well-stocked bar are also on offer. You can unwind on our Millstream garden patio or make full use of our huge 300-seater family patio, equipped with a playground and a children's adventure zone. Our main function suites, the Riverside and Lakeside, can cater for up to 180 people and we specialise in tailor-made wedding receptions. 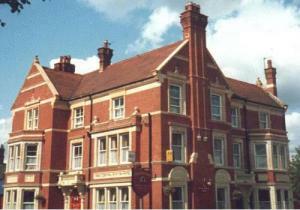 The 3-star Ramada Leicester is in a city-centre location, offering the Club Bar & Restaurant and a local health club. Offering everything you would expect from an international hotel company, the Ramada Leicester is within a Grade II Listed building, built in 1898. The bedrooms are designed to provide an undisturbed sleep by night, as well as the facilities and entertainment you demand by day. Each has an en suite bathroom and a variety of modern facilities. The business services and conference facilities will meet the highest expectations, with support available should you need it. 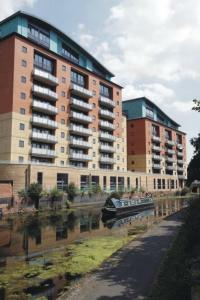 Close to the Ramada Leicester are the National Space Centre, the Great Central Railway and Snibson Discovery Park. There is fabulous shopping at nearby centres Fosse Park and the Shires. Historical sites close by include Leicester Guildhall and Castle Gardens, with churches, ancient walls and gateways. Visit the beautiful converted pub and restaurant, featuring exceptional Indian cuisine in an outstanding setting. The fully licensed and air conditioned restaurant seats up to 100. There is a safe outdoor play garden for children, with seats and tables for drinks and al fresco meals on the hot sunny days. Fully-equipped, comfortable rooms all have en suite facilities. Accommodation is comprised of single, double, twin and family rooms. 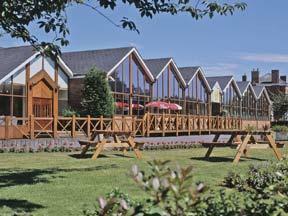 There is plenty of CCTV covered private car parking and Wi-Fi access is available in the hotel. In the centre of Leicester, just 5 minutes' walk from the train station and the very heart of the city, this modern hotel offers comfortable accommodation and good facilities at great-value rates. The Ibis Hotel Leicester is just a 5-minute walk from the city's main business centre and all of Leicester's great shops, restaurants and bars. The hotel's convenient central location also means it offers good access to the region's major roads. The M6, M1 and M69 motorways are all within easy reach. There are 94 well-equipped modern rooms. Every room has all the modern comforts and facilities you need, whether you are exploring the area as a tourist or visiting on business. Each room has private shower facilities and a TV with pay-per-view TV and internet access. Reception is open 24 hours. A continental buffet breakfast is available each day at an additional cost and dinner is available in the hotel's informal restaurant from 18:00 until 22:00. There is also a 24-hour snack service. Situated within the beautiful landscape of Belvoir, Nottinghamshire, you can enjoy tasty cuisine and cosy rooms, each with its own unique details. All our rooms are individually decorated to a high standard with a contemporary, country feel, and all are fully en suite. We offer both smoking and non-smoking areas to sit and relax over a drink. The comfortable leather sofas allow you to sink down and forget the stresses and strains of your working day. Our fully stocked bar and extensive wine list boast drinks from all over the world, enhancing our cosmopolitan feel. 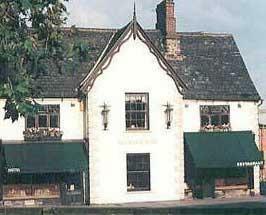 Originally built as a farmhouse in 1672, the Fieldhead is situated on the edge of Charnwood Forest, just 7 miles (11 km) from Leicester and 1 mile (1.6 km) from junction 22 of the M1. Built from local stone, this charming traditional inn has a cosy restaurant, a bar and a terrace. The seasonal menus offer a wide selection of modern and traditional British favourites, from hearty main courses to lighter snacks. A selection of real ales, carefully selected wines and speciality teas and coffees are also available. The hotel offers 28 comfortable en suite rooms, each of which is individually decorated with its own unique charm. Whether you are exploring the region as a tourist or visiting the area on business, the Fieldhead has a relaxed and inviting atmosphere, mouth-watering food and cosy rooms. The Barcel? Hinckley Island Hotel is a unique modern hotel located in Hinckley. Set in the lovely rolling countryside we are within easy reach to Stratford-upon-Avon, Coventry and Warwick. Innovative design accommodates the luxury, facilities and immaculate service of a four star hotel within a refreshingly different character. Set in lovely rolling countryside within easy reach of the sightseeing and cultural attractions of nearby Stratford-upon-Avon, Coventry, Warwick and the diverse shopping, entertainment and nightlife of Birmingham and Leicester. 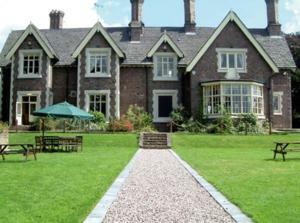 The Old Manor Hotel is a comfortable privately owned hotel, in the attractive, 500 year old former manor house. The hotel enjoys a quiet central location, overlooking the fine parish church, just 5 minutes walk from the centre. With your comfort and enjoyment in mind, all the bedrooms are furnished to the highest standard. All our bedrooms are individually designed and furnished and many feature medieval oak-beamed ceilings and walls. All rooms have en suite shower or bathrooms and the in-room facilities that you would expect in a luxury hotel. The decor is individual, rich and earthy throughout, but the overriding emphasis is on comfort within an atmosphere of relaxed friendliness.